When we talk about point of view, we basically mean the perspective from which the story is told. Who are we listening to when we read the story? Whose head are we in? Whose eyes are we watching the story through? Point of view isn’t merely another writing craft technique. Point of view is the foundation upon which great fiction rests. Why do I say point of view is so essential to writing a good book? Reason #1 – Well executed point of view allows the reader to experience (and participate in) a situation that they could never have been part of, or might never want to be part of, in real life. Consistent and skilled use of POV not only allows us to live vicariously, but also gives us the opportunity to examine ourselves and think about whether we would have made the same choices as the characters. In other words, we become participants in two senses of the word. It engages our emotions and our minds. Reason #2 – Well executed point of view builds subtext, as we’re able to contrast what’s happening around the character with what they think about it. We can sort through the difference between reality and perception, the difference between the objective and subjective. Reason #3 – Well executed point of view sets each character apart, as we see how they uniquely interpret the world around them. 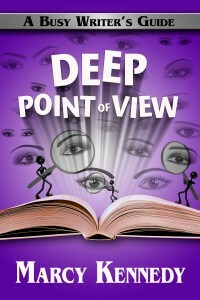 Put another way, point of view is the tool we use to create three-dimensional characters. When we don’t understand point of view and when we don’t execute it correctly, we’re very likely to end up with flat, uninteresting characters. Beyond this, as novelists and short story writers, we have an advantage in that we can give our audience that filtered perspective. They can’t receive that from television or movies or plays. Reason #4 – Well executed point of view controls the flow of information to either create suspense or forward the plot. As authors, how we choose to handle POV determines what we must and can’t show to the reader. As readers, it creates the page-turning excitement as we discover things along with the POV character. Reason #5 – Well executed point of view encourages showing rather than telling. “Showing” in fiction rather than “telling” is one of the most common pieces of writing advice and also one that a majority of writers struggle to execute. Understanding and writing from a close point of view makes this concept easier because we’re experiencing the story through the eyes of a particular character. Reason #6 – Well executed point of view helps us decide what description belongs in the story. Many writers buy into the fallacy that description slows a story down. Description doesn’t slow a story down—bad description or description placed where it doesn’t belong slows a story down. When we write with a clear point of view, we’ll know what details are important to include and when is the appropriate time to include them. Reason #7 – Well executed point of view shows us when to include backstory and when to explain details about our world and setting or about the way something works. How much or how little to explain these elements to readers becomes a stumbling block for many writers. When we have a clear POV, we’ll know to include it only when the POV character would naturally be thinking about it or noticing it. Point of View in Fiction: A Busy Writer’s Guide Is Now Available! 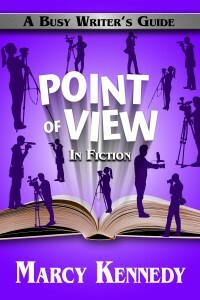 You can grab a copy of Point of View in Fiction from Amazon , Apple iBooks, Barnes & Noble, and Kobo. It’s also available in print. Welcome back to my ongoing series on point of view in fiction writing. Today is the final installment for first person point of view. So far we’ve talked about the nature of first person POV and how to write a successful first person POV story. Now it’s time to look at the three most common challenges in first person POV and potential ways of handling them. Solving these problems is more about deciding on the best path for your story than it is about a right vs. wrong rule. If you’re writing in first person past tense, you always have a time issue. The POV character is telling the story from a distance position. It’s already happened. Some of the tension is removed because we know the first person narrator survives the story being told. There are ways around this. You could write in first person present tense (which many readers still find jarring even after the success of books like The Hunger Games). You could have someone else read the account left by the first person narrator, so until we reach the end of the story, we don’t know how long they survive the tale they’re telling. Another way to handle this is to put your character in non-death jeopardy or in jeopardy where death is only one of the possible outcomes. A character can survive while still emerging horribly scarred either mentally, emotionally, or physically (e.g., in Stephen King’s Misery). A character can survive while still risking the possibility of losing someone they love and would have gladly given their life to save. Because the first person POV narrator already knows what happens, we face the problem of why they don’t just tell us the ending right away. In most cases, as writers, we know that would kill our story by removing the tension. You can withhold the ending as long as you play fair. In other words, you must have the first person narrator tell the reader everything they knew at that point in time where we are within the story. If you withhold it, you’re cheating the reader, and instead of feeling like we’re part of the story, we end up feeling the artificial constructs surrounding it. In some genres, like cozy mysteries, you get one free pass. When the sleuth discovers the true identity of the murderer, you can (note I’m saying can, not should) withhold the identity of the murderer just long enough for the sleuth to set a trap for them (or bring them to justice in some way). There shouldn’t be a large gap between the sleuth discovering the identity of the killer and revealing it, though, or again, you risk the reader feeling like they’re being played with. At some point in most books, your POV character is going to experience a particularly emotional event. How are you going to handle narrating that event? If you haven’t asked yourself that question and you want to write in first person, you need to think about it. Think back to the last traumatic experience in your life. How clear are your memories of it? How clearly were you thinking at the time it happened? Now how do you translate that to the page in a way that it doesn’t either come across as confusing for the reader, melodramatic, or cold and clinical? Because if you allow your character to present it in all its chaotic, messy, heart-rendingly emotional glory, you risk confusion or melodrama. If you have your character present it factually and clearly, you risk them coming across as cold or unrealistic. Experience is the only real teacher for finding the balance to these scenes. You’ll want to specifically ask your critique group, beta reader, or editor about these scenes and how they come across. Then tweak, seek advice, and repeat. It’s a lot like learning to balance on a bike or on ice skates. Once you have the feel for it, you’ll be able to stay upright. What’s your biggest pet peeve about first person POV books? If you’ve enjoyed this series of posts on POV, I hope you’ll consider signing up for my How to Master Point of View webinar running this Saturday. (If you can’t make it, sign up anyway. All registrants will receive a recording of the session.) Cost is $45! Sign up here. Or you can sign up for the WANA2Fer where you can get my POV webinar and Lisa Hall-Wilson’s webinar on How to Write Effective Inner Dialogue for only $70. That’s a $20 savings. Sign up for the 2Fer here. I hope you’ll check out the books in my Busy Writer’s Guides series, including Strong Female Characters and How to Write Dialogue. 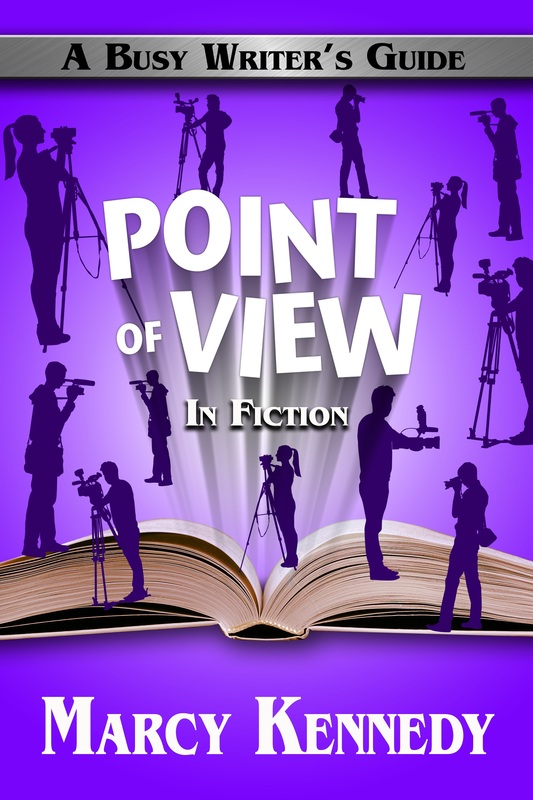 Last week we continued our series on point of view in fiction with an opening look at first person POV, including what it is, the different ways it’s being used in modern fiction, and some of the benefits and drawbacks that come with writing in first person POV. Over the next two POV posts, I’m going to look at the five aspects you need to manage well if you want your first person POV book to work and the most common challenges you’ll run in to when writing in first person POV. 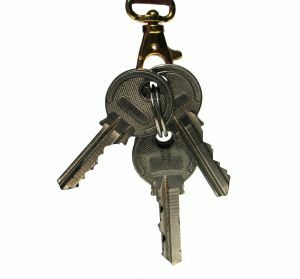 These five keys aren’t exclusive to writing in first person, but they are the core of writing successful first person POV and represent mistakes writers more often make when tackling this point of view for the first time compared to other POVs. (1) Create a unique character voice. Many authors think they’re created a unique character voice if they give their character a catch phrase or a dialect quirk, but that’s not what unique character voice means. When we talk about character voice, those things do come into play, but what we really mean is that character’s unique outlook and personality expressed in their thoughts and speech. Readers enjoy first person POV in part because of the intimate look at the way another person views the world. Fiction allows us to explore this new perspective in a way we never can in our daily lives. How do they view themselves? How do they feel about the big ticket items like love and faith? How do they feel about the people closest to them? Are they cynical or optimistic? More might come to you as you answer these. Once you’ve answered all the questions you can think of, consider how this will affect the tone of what your character says and thinks, the things she comments on, and the little asides he makes to himself. That’s where a unique character voice grows. First person is all about interpretation by the narrator. Or, in some cases, misinterpretation. How and what the narrator interprets are important elements of characterization. Showing change in how and what they interpret is an important element of their character arc and growth throughout the book. (2) Show us not only what they’re doing but also why they’re doing it and how they feel about it. Motivations and reactions are what give first person POV the intimate feel that’s one of its strengths. Have your first person narrator respond in their head to something said aloud or to jump ahead and make assumptions about what they think the other person will say next. Let us know why they’ve decided to respond in a certain way. Afterward, show us how what they did is affecting them emotionally and mentally. These chains are more important in first person POV than in any other. (3) Remember that you still need to write in scenes. The temptation when writing first person POV is for it to almost become stream of consciousness, but you still need to write in scenes. We don’t need to see every detail of the POV character’s life. We still only need to see the things important to the story. Each scene should have a goal, you should enter as late as possible, and you should leave as early as possible. (4) Alternate internal with external so the story doesn’t feel claustrophobic. More than any other POV, first person POV can feel claustrophobic because you’re usually trapped in one character’s head the whole time. (This is the negative flip side of the intimacy it gives.) And because that character is telling the story directly—in other words, there’s no distance at all—it’s easy to fall prey to the talking head syndrome. Talking head syndrome is where your character narrates for paragraphs (or even pages) without any external stimuli. The reader starts to feel like the character is just a disembodied head floating in empty space because they don’t see, hear, feel, smell, taste, or touch anything happening around them. Don’t put your first person POV character in a bubble. It’s important that you regularly alternate between internal (your character thinking/narrating/feeling) and external (the five senses/action/setting/dialogue). When you alternate every paragraph or every other paragraph between internal and external, you keep the reader grounded both in the world around them and in the emotions and thoughts of your character. (5) Make sure your first person narrator doesn’t come across as stupid. Throughout your book, your first person POV character will likely miss something important, misinterpret information, or otherwise overlook a clue you’ve planted. If you don’t want your first person narrator to come across as stupid when they miss something, make sure you create events that could easily have two possible interpretations or a situation where it would be believable for them to have missed that clue. Having a character who’s too stupid to live in third person POV is annoying. In first person POV, it can kill the book. If you regularly write in first person POV, what other tips would you give for someone who’s trying it out for the first time? Or what other questions do you have about writing in first person POV? And remember, Frozen (my book of suspense short stories) is on sale for 99 cents only until tomorrow! Check it out here. How Is First Person POV Different? What Is Head Hopping and How Can We Avoid It? Today I’m launching into the first of three posts talking about first person POV. I want to talk about what exactly first person POV is and how it differs from the other points of view before we dive in to how to write successfully in first person POV and how to tackle some of the most common challenges that come along with writing in first person POV. 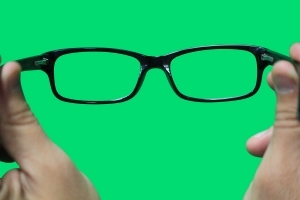 What Do We Mean by First Person POV? One of the major strengths of first person POV is its intimacy. We’re being brought into the confidence of a character. Most of the time, when you use first person POV, you’ll only use that single POV throughout the book (like in The Hunger Games by Suzanne Collins or The Shifter by Janice Hardy). However, that’s not a rule. Authors have successfully used more than one first person POV in the same book or a combination of first and third. You can use multiple first person points of view like in Kathryn Stockett’s The Help. I wouldn’t recommend using multiple first person points of view for new writers because it’s difficult to do well. You can use a single first person point of view for most of the story and then switch to third person for scenes where the first person narrator isn’t present. The theory behind this is that the first person narrator is telling us the story, and the parts in third person are pieces he was told about later. A good example of this is Dragon Bones by Patricia Briggs. You can use first person for the villain’s scenes in an otherwise third person POV book. This is a way you can hide the identity of the villain. (After all, how many of us think of our names on a regular basis. I don’t.) Julie Garwood did this in her romance novel The Bride. Or, if you just want to dip your toes into first person, you can use it as a bookend prologue and epilogue to an otherwise third person POV story like in Beverly Lewis’ The Shunning. How Is First Person Fundamentally Different From the Other POVs? Other than the obvious use of I rather than he/she, writing in first person comes with a big opportunity—and a big challenge—that isn’t involved when you’re writing in third person or omniscient POV. By its very nature, first person point of view is more self-conscious than any of the other POVs. The POV character is telling their story to someone. You can see hints of this in the way many first person stories include a paragraph where the narrator introduces himself. Take a look at how Harry Dresden introduces himself in Jim Butcher’s Storm Front and how Abileen does it in The Help. You, as the writer, need to know why your first person narrator is telling the story and who their intended audience is. The purpose, intention, or goal of the first person POV character in telling the story is what should be driving your narrative. Everything you write should forward the goal the first person narrator has in telling their story. By knowing this, you give your story focus it won’t otherwise have. You don’t have to directly reveal your first person narrator’s goal or their intended audience to the reader. In most cases, you shouldn’t directly reveal them. But they need to be clear in your head. The self-conscious nature of the first person POV story means the reader can’t always be certain if the narrator is reliable or unreliable. Beyond this, the narrator can be either intentionally or unintentionally unreliable. In third person POV, the point of view character can lie to themselves, lie to other characters, or have a false impression of reality, but they can’t lie to the reader because they’re not aware the reader exists. Large parts of the story will be “objective” because they’re “outside” the POV character. * This is the biggest difference between first and third. In first person POV, the character is talking to us in some sense. Because they’re speaking to us, they can also lie to us. Which means we have to ask, “Are they lying to us?” Presenting themselves in a certain way even if it’s not entirely accurate because they want to be perceived in a particular way (e.g., they want the reader’s sympathy or respect)? Because they want to convince us of something? Are they unable to see reality, and so they’re giving us their perception but not the truth, making them unintentionally unreliable? Playing with these aspects is part of the fun of using a first person narrator and also part of the challenge. If you’re writing an unreliable narrator, you’ll need to drop subtle hints for the reader. The reader wants to be able to figure out what’s really happening, and to do that, they need hints about whether they can trust the narrator or whether they might need to doubt their story as it’s being told. Have you tried writing in first person POV? What did you like about it? What did you dislike about it? * I placed “objective” and “outside” in quotation marks because if we’re writing third person POV properly everything is still filtered through the eyes of the character. However, it’s still filtering. We still see what happens in an objective sense. The driver in front of our POV character slams on their breaks and our POV character hits them because she was tailgating. That’s what objectively happened. How it’s described and what details we receive depend on the POV character. It’s like a coloring book where the POV character fills in the colors but the lines are already there. In first person, however, it’s not just filtered. It’s created. They might tell us that they accidentally slammed into the car in front of them, but it might not have been an accident at all. They might be interpreting events for us in such a way as to make us believe that they weren’t out to get their ex-husband’s new wife. It’s like having a blank page where the POV character first draws the picture and then colors it in. A couple of weeks ago I began a series on point of view, and the first POV I dug into was omniscient, where I pointed out that if you want to write in omniscient, you needed a strong voice as a writer. So today I’m continuing on with my seven tips for developing your voice. A distinct voice seems to be the thing that everyone wants but no one can tell you how to get. And I have to admit this annoys me. I’m a very practical person. If you can clearly tell me how to do something, I’ll get it done for you. If it’s ooey gooey and you tell me “it just has to develop over time,” I’m going to be cheesed. I’m also going to set out to figure out how to do whatever you’ve just told me can’t be taught and has to develop organically. 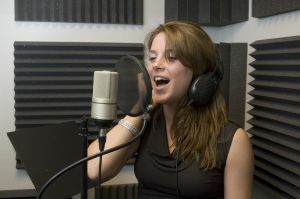 Developing your voice–like everything else in writing–takes time and discipline, but it can be done. So here are some ways you can actively work on developing your voice. Before you argue that this will only teach you to write like everyone else, hear me out. Can an artist sculpt a lifelike statue without first learning about the features of different types of stone and without learning how to use a chisel and other tools? Can a pianist compose a sonata without first learning which notes sound good together? One of the most important things a writer trying to develop their voice can do is to read craft books. Writing is just like any other skill, whether that be painting, woodworking, engineering, or neurosurgery. You have to be so solid on the basics that they come instinctively before you’re able to truly create something fresh and unique. In her excellent post on Ways to Develop Your Unique Writing Voice, social media maven and bestselling author Kristen Lamb pointed out how boundaries can actually free your creativity rather than limit you. She likened setting boundaries in writing to narrowing down what means of transportation want to use to take your vacation. If you want to develop your voice more quickly, pick a point of view (first person or third person – if you’re not sure what that means, check out my post on point of view) and a genre and stick to it until you’ve mastered it. How will this help? Each genre comes with conventions that you need to follow to write in it. POV adds structure and establishes how you can tell your story. When some of these big decisions are settled, you’re free to focus on the actual writing. In other words, you’re free to allow your voice to come out. Read a lot is one of the few pieces of advice novelists are given for developing their voice. But reading alone isn’t enough. You need to figure out what works in these books and what doesn’t. What do you love and hate about them? It could be something big picture (like the way they weave their theme throughout the book) or it could be something more subtle (like the cadence they use in their sentences). For each book you read, try to identify and write down three things you loved and three things you didn’t. For the things that you didn’t enjoy about the book, ask yourself why you didn’t like them and how you would have done them differently. In her post about Author Voice Vs. Character Voice, romance writer Roni Loren describes her author voice and then points out how it directly relates to who she is as a person and how she approaches life. Your voice is you. Sit down and make a list of 15-20 words that describe you, then elaborate on each and how you see that trait expressed in a normal day. For example, I’m quirky, sarcastic, thoughtful, structured, and equal parts dark and optimistic. So is my voice. By identifying who I am, I can look at my writing and see what parts are true to me and what parts aren’t. I know. I know. Up above, I told you to read and analyze. That was one step along the path. But eventually, you’re going to need to make sure that you’re starting to sound like you rather than subconsciously copying another writer. The only sure way to do that is to stop reading other people’s work. Take 1-2 months and use your reading time to write instead (or exchange novels for books on craft). This isn’t meant to be maintained long-term. You only need to stay in this stage until you start hearing yourself. I made the biggest jump in developing my own voice when I stopped reading temporarily. What flows off your tongue? What comes naturally? What doesn’t? Reading your work out loud helps you smooth out the tongue twister passages and create more realistic dialogue, but it also helps with voice. What sounds right to your ear? Could you see telling the story this way out loud to your friends? The only way you can develop your unique voice is to be proud of who you are and how you sound. As soon as you start worrying about what other people will think or whether they’ll like your voice, you’re going to start trying to change it. Blogging helps you learn to be comfortable with who you are and with sharing who you are with readers. Writing magazine articles is another way to help develop your voice in a public forum. What other ways have you found to develop your voice? Do you agree with me that it can be developed or do you think it needs to develop organically? What author’s voice do you love the most? A couple months ago, I was excited to be offered a chance to read and review Gilbert Morris’ The River Rose. 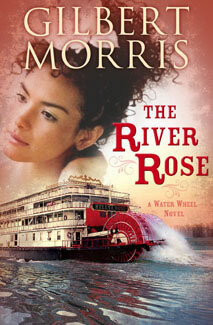 The River Rose is a historical romance about a woman steamboat captain in 1850, and Gilbert Morris co-authored my favorite series of books during my late high school and early university years, the Cheney Duvall, M.D. series. I love a clean read (referring to content rather than editing). I love a strong female protagonist. And I love a detail-rich world. The River Rose gave me all of these, and yet, I found myself disappointed. Because of my great respect for this author, for all he’s achieved, and for the Cheney Duvall series, which still makes me laugh and continues to sit on my shelf of favorites after all these years, I refuse to publicly speak ill of this book, especially since I think the problem is one of personal preference. I don’t like omniscient POV. I’ll write more about point of view (POV) in another series of posts, but here’s a basic way to think of it. When we’re young, our mothers or fathers or grandparents tell us stories. They’ll tell us what each character is thinking or feeling at any moment. They’ll even tell us things the characters don’t yet know. They’re all-knowing in the story world. And we’re alright with that because we don’t want to experience the story as if we were one of the characters. 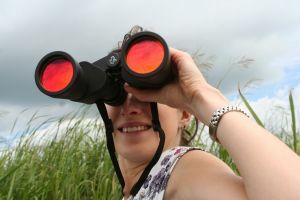 We want to be safely watching from a distance while our loved one gives us the big picture view. This used to be the case in most fiction 100 years ago. It would have been improper somehow to poke intimately into a stranger’s story, and we weren’t that far removed from the days when most people were illiterate and the majority of stories were still told orally. Omniscient POV was the norm. But as we grow and as our society changed, we no longer want to be told a story. We want to see it and live it. We gobble up reality TV. We watch movies in 3-D. Our video games are using cameras to capture our movements to power avatars we created to look like us. We now want stories written in first person or in intimate third person (deep POV). We want to feel like we’re part of the story. At least, I do. I’ll be one of the first standing in line when they create a Star Trek-style holodeck. So it’s not simply The River Rose. I felt the same way about Rachel Aaron’s excellently written Spirit Thief series. Despite the unique plot and beautiful language, I couldn’t connect. Even though omniscient POV shouldn’t be confused with the head-hopping that will get your book rejected by agents and readers alike, to my brain, conditioned to first person and intimate third person styles, I felt jarred out of the story whenever I was told something the character I was currently trying to identify with couldn’t possibly know. I subconsciously sought that identification even once I figured out the book used omniscient POV. Many genres still embrace omniscient POV, including historical fiction, so I’m sure other people will love this book. For these reasons, I’m excited to be able to give away a copy to one person today (US only). Share this post and leave a comment to be entered. Do you feel the same way about omniscient POV? Do you think we’ll see less and less of it in the coming years or do you think, like many fashion trends, it’ll be back?